I’m trying to wrap my head around the extended mind hypothesis (EMH). I’m doing so because I’m interested in its implications for the debate about enhancement and technology. If the mind extends into the environment outside the brain/bone barrier, then we are arguably enhancing our minds all the time by developing new technologies, be they books and abacuses or smartphones and wearable tech. Consequently, we should have no serious principled objection to technologies that try to enhance directly inside the brain/bone barrier. Or so some have argued. I explored their arguments in a previous post. In this post, I want to do something a little different. I want to consider how exactly one should interpret the claim that the human mind can extend into the external environment. To do this, I’m calling upon the help of Katalin Farkas, who has recently written an excellent little article entitled “Two Versions of the Extended Mind”. In it, she argues that there are two interpretations of the EMH, both extant in the current literature. The first makes a wholly plausible and, according to Farkas, uncontentious claim that can be endorsed by pretty much everyone. The second is rather more contentious and, arguably, more significant. In the remainder of this post, I will go through both interpretations. Before I get to those interpretations, I need to run through a few key conceptual distinctions. First, I need to distinguish between different types of mental event. We all know what the mind is: it is that “thing” that thinks, feels, believes, perceives, dreams, and intends. Mental events are the events that happen within the mind, i.e. the thinking, feeling, believing, perceiving and so on. By describing it in this way, I do not mean to rule out the possibility that the mind is itself an extended set of events (and so not a “thing” per se). The mind could well be an extended set of events and still consist of sub-events like believing, perceiving, dreaming, intending and so forth. Events in the Stream of Consciousness: As the name suggests, these are the mental events that form part of the subject’s occurrent conscious life. They include things like the taste of chocolate, the feeling of warmth, the perception of red and so on. This distinction turns out to be important when it comes to understanding what is being “extended” when we talk about the extension of the mind. That is to say, it is important when it comes to understanding the content of the mental extension. It is, however, less important than the next distinction when it comes to understanding the two competing interpretations of the EMH. That next distinction arises from the functionalist theory of mind. According to that theory, whether something counts as a mental event or not depends on the role that it plays in fulfilling some function. Thus, for example, something counts as a “belief” not because it is made of a particular substance (res extensa or res cogitans) but because it has a particular role in an overarching mental mechanism. Thus, it can be said to counts as a belief because it is capable of producing certain conscious states, action plans and decisions. The Mental Realiser: This is the object or mechanism that realises (i.e. constitutes) the mental event. In other words, it is the physical or mental stuff that the event is made out of. The Mental Role: This is the position (or locus of causal inputs and effects) that something occupies in the mental system. This distinction is important when it comes to understanding the method or nature of mental extension. In fact, a very simple way to understand Farkas’s main contention is that when it comes to extending the mind, there is a significant difference between realiser-extension and role-extension. The former is trivial, and can arguably be embraced by non-functionalists. The latter is more significant. Let’s try to see why. 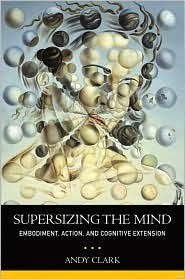 As mentioned in the introduction, the gist of the extended mind hypothesis is that the mind can extend out beyond the brain/bone barrier. There may be sound evolutionary reasons for our minds to be limited to that space, but according to proponents of the EMH there is simply no good, in-principle, reason to suppose that the mind has to remain confined to the three and half pound lump of squidgy biomass that we call the “brain”. Diva’s Case: There is a documented case (from the University of California’s Institute for Nonlinear Science) of a California spiny lobster, one of whose neurons was deliberately damaged and replaced by a silicon circuit that restored the original functionality: in this case, the control of rhythmic chewing. (...) now imagine a case in which a person (call her Diva) suffers minor brain damage and loses the ability to perform a simple task of arithmetic division using only her neural resources. An external silicon circuit is added that restores the previous functionality. Diva can now divide just as before, only some small part of the work is distributed across the brain and the silicon circuit: a genuinely mental process (division) is supported by a hybrid bio-technological system. Here, the hybrid bio-technological system constitutes an extended mental realiser for the performance of mental arithmetic. The word “constitutes” is important. The claim is not merely that the extended system causally precedes the mental event; it is that the extended system either is or grounds the mental event. What’s more, this claim applies to standing states just as much as it applies to events in the stream of consciousness. Indeed, in Diva’s case it is a mental event in the stream of consciousness that is getting its realiser extended beyond the brain/bone barrier. Farkas argues that this version of the EMH is fairly trivial. Indeed, she goes so far as to say that non-functionalists and some dualists may be able to embrace it. All it is saying is that if some physical realiser is necessary for mental events (and many theories of mind accept that a physical realiser is necessary, even if it is not sufficient) then there is no reason to think that the realiser has to be made up of neurons, or glia or whatnot. Not unless you think that neurons have some magical mentality-exuding stuff attached to them. The more significant interpretation of the EMH claims that more things can count as performing a mental role, even when they seem remarkably distinct from what traditionally seems to perform that role. As Farkas sees it, this is largely a claim about what counts as a standing mental state and, more precisely, as a claim about the possibility of extending the set of things that can count as a standing mental state. Inga and Otto: Imagine there is a man named Otto, who suffers from some memory impairment. At all times, Otto carries with him a notebook. This notebook contains all the information Otto needs to remember on any given day. Suppose one day he wants to go to an exhibition at the Museum of Modern Art in New York but he can’t remember the address. Fortunately, he can simply look up the address in his notebook. This he duly does, sees that the address is on 53rd Street and attends the exhibition. Now compare Otto to Inga. She also wants to go to the exhibition, but has no memory problems and is able to recall the location using the traditional, brain-based recollection system. The essence of Chalmers and Clark’s original paper was that there is no significant difference between what happens in Otto’s case and what happens in Inga’s case. They can both be said to “believe” that the Museum of Modern Art is on 53rd Street, prior to “looking up” the information. It just so happens that in Otto’s case the recollection system extends beyond his brain. Farkas argues that this is a very different type of extension when compared with that of realiser-extension. In this instance, it is not simply that the notebook replaces the brain with a functionally equivalent bio-technological hybrid; it is that the notebook mediates the recollection process in a very different way. Consequently, to say that Otto’s mind extends into the notebook is to say that we should be more liberal in our understanding of what kinds of system can count as fulfilling a mental role. To see this, it helps to consider some of the important differences between the recollections of Otto and Inga. First, note how they are phenomenologically distinct. Inga gains access to the relevant information through direct mental recall, not mediated by any other sensory process; Otto needs to literally see the information written down in his notebook before he can be said to “recall” it. Second, note how Inga’s “belief” is more automatically integrated with the rest of her mental system than Otto’s. If Inga learns that she got the wrong address, this will affect a whole suite of other beliefs and desires she might have had. In Otto’s case, learning that he has the wrong address will simply involve deleting the entry from his notebook and correcting it. This will not immediately affect other entries in the notebook that relied on the same information. One could point to other differences too but these suffice for now. Some people argue would argue that these differences should lead us to re-evaluate the Inga-Otto thought experiment. In particular, they should lead us to say that Otto does not really believe that the Museum of Modern Art is on 53rd Street and that Inga does. The problem is that proponents of the EMH can come back and highlight how focusing on phenomenological and integration-based differences between Otto and Inga can affect how we interpret other cases. For example, the phenomenology of recollection varies greatly from case to case. I remember all of Macbeth’s “full of sound and fury” monologue from Act 5, Scene 5 of Macbeth. But in order to remember the fifth line (“Til the last syllable of recorded time”) I actually need to speak, out loud, the first four lines. That does that sensory intermediation deny me the status of an ordinary mental recollection? Likewise, with respect to automatic-integration, it is possible that Otto could have a “smart” organiser that automatically updates other entries with the new information. This is something that is increasingly a feature of smart devices with cloud-based syncing. And this is where the EMH becomes significant. By responding to critics of their position in such a manner, proponents of the EMH are arguing that we should be much more ecumenical when it comes to determining what can count as a standing mental state. That’s what EMH (2) is claiming. Furthermore, this time round the claim is that the extension is limited to standing states and does not also encompass events in the stream of consciousness. There is a good reason for this. As Farkas sees it, EMH (2) isn’t really about physical expansion outside the brain-bone barrier in the way that EMH (1) is. For all that proponents of EMH (2) care, the notebook-lookup system could be located entirely within the confines of Otto’s skull. That wouldn’t make a difference to their claim. What matters for them is that we are less restrictive when it comes to determining what counts as a providing the basis for a mental standing state. Where does that leave us? Well, it leaves us with two versions of EMH. The first is relatively straightforward and simply claims that mental-realisers need not be confined to the brain. The second is more contentious and claims that we should have a more expansive conception of what can count as a standing mental state. To really understand the significance of the second version it helps if you consider Chalmers and Clark’s original criteria for assessing whether something could count as standing state. They suggested that anything that was readily accessible and automatically endorsed could form part of the extended mind loop that constituted a belief or desire. This could include something like the information in Otto’s notebook, the information stored on the Web, and also, more controversially, the information stored in someone else’s head. Imagine a really close couple who are in the habit of relying upon the mental content stored in their partners’ heads. In many ways, they would be just like Otto and his notebook. But if it is possible for all such closely connected information-exchange partnerships to form part of an extended mind, we will find ourselves in some pretty tricky ethical and social waters. What does it mean for privacy? Individual autonomy? Responsibility and blame? Praise and reward? All of these concepts would need to be revised if we fully embraced the implications of EMH (2). That is some serious food for thought.